Ruth Wajnryb was born in Sydney to two Polish Jewish physicians who had survived the Holocaust and emigrated to Australia. She graduated with a degree in education from the University of Sydney in 1974, and started teaching. But after becoming increasingly interested in teaching English as a second language to immigrants, she returned to the University of Sydney for a master's degree in applied linguistics and later completed a Ph.D. from Macquarie University. She joined the staff of the University of New South Wales and headed the teacher training department of the Institute of Languages. She wrote books on teaching English and developed her own successful technique, known as ''dictogloss,'' which combined the features of a dictionary and a glossary. She traveled to Asia, the USA, and Europe and became an internationally-renowned authority. In 1976, she married Alberto Levin, an Argentinian, with whom she had a son. A year later the couple separated. She had a daughter from another relationship in 1987. Dr. Wajnryb became a long-distance professor at Anaheim University in California and The New School in New York City. She wrote a weekly column for Australia's leading newspaper, The Sydney Morning Herald, for eight years. 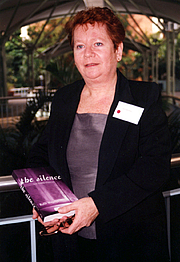 Her book The Silence: How Tragedy Shapes Talk (2001) about Holocaust survivors and their families, won the New South Wales Premier's History Award for 2002. Her most popular book, Expletive Deleted: A Good Look at Bad Language, was first published in 2005. Ruth Wajnryb is currently considered a "single author." If one or more works are by a distinct, homonymous authors, go ahead and split the author. Ruth Wajnryb is composed of 3 names. You can examine and separate out names.